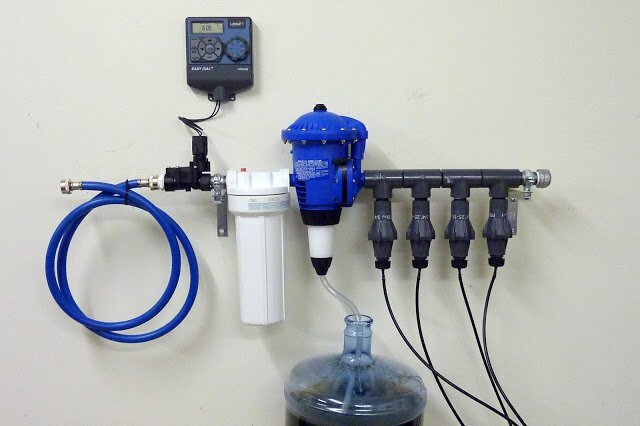 – A stable always-on water connection. One that will not ever be turned off by accident. Living walls need constant watering, sometimes daily. A washer connector hose will be connected to a 3/4″ hose valve dedicated to the living wall. Consider housing the components in a utility locker. – Relyable valve and timer. Use professional and simple systems. One valve is usually all that is needed to water the entire wall. Zones can be applied to various exposures over the face of a living wall. 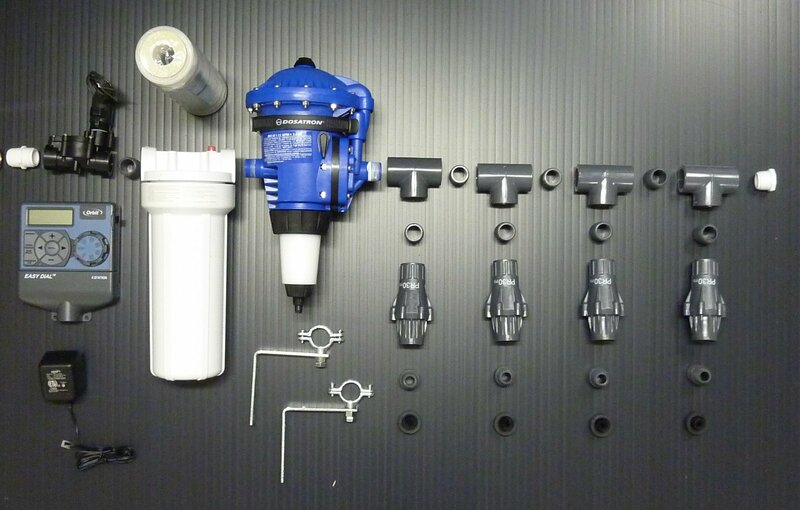 – Water filter to remove chlorene and mineral deposits. Chlorene will kill natural microbiology in the soil necessary to break down complex molecules into food for the plant. Mineral buildup in the felt will affect pH levels and clog watering lines. – Food Injectors provide a steady flow of nutrients to the plants. Organic based fertilizers are more gentle and encourage microbal growth near the roots that also absorb and break down toxins from the air. A specificly deluted plant food of any type is injected at a perscribed ratio. Accurate injectors operated by water flow are very relyable. – Pressure Regulators are necessary to keep the water pressure even in the top and bottom rows of soaker hose in the living wall. Without them, more water will flow to the lower levels leaving the top level high and dry. – Brackets to mount it to the wall.